Blogging journalists in Denmark are up in arms over a renewed effort by Danish newspaper publishers to stop websites like Google News  from linking to individual articles rather than a newspaper's homepage. They call this “deep linking” , and it is precisely what bloggers usually do. Regardless of what is considered normal practice around the world, the Danish Association of Newspaper Publishers  insist they only want homepage links, so they can better control the user experience. Specifically, the Danish Newspaper Publishers Association  are frustrated that Google News in Denmark wants to list and link to articles of Danish newspapers without paying them royalties. Danish blogger, Peter Svarre  writes, “AAAARRRRGH!” upon reading arguments against Google News. There was a similar dispute  in Belgium in 2006-7, when newspapers there took Google News to court and according to Finfacts threatened to fine them  €1 million a day if they kept linking. In Denmark, there are also precedents. In 2002, the Danish Newspaper Publishers Association took a Danish web company, Newsbooster, to court for emailing links to news articles to their customers. Newsbooster was forced to shut down . On Medieblogger , Lars K Jensen quotes [Da] from a recent email discussion on the mailing list of the Danish Online News Association (DONA) , where the chief legal adviser from the Danish Union of Journalists, Anne Louise Schelin , responded to a question about the official rules for citation and linking. Schelin advised, that one should never link to anything but a website's homepage, even in an email to colleagues about a specific article. The only redeeming factor would be whether a link could be considered “loyal,” she said, referring to a Danish court case  between two real estate websites from 2006. Others on the mailing list vehemently disagreed. One called it “nonsense from the fax generation”. Blog editor of Politiken newspaper, Kim Elmose published his response in his personal blog Mediehack , calling the resistance to deep linking counter productive, and pointed to the irony that most Danish journalists use Google News as a tool themselves. 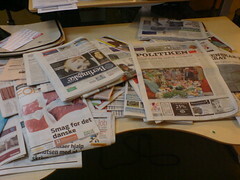 * Photo above of Danish newspapers is by Jacob Bøtter  on Flickr.